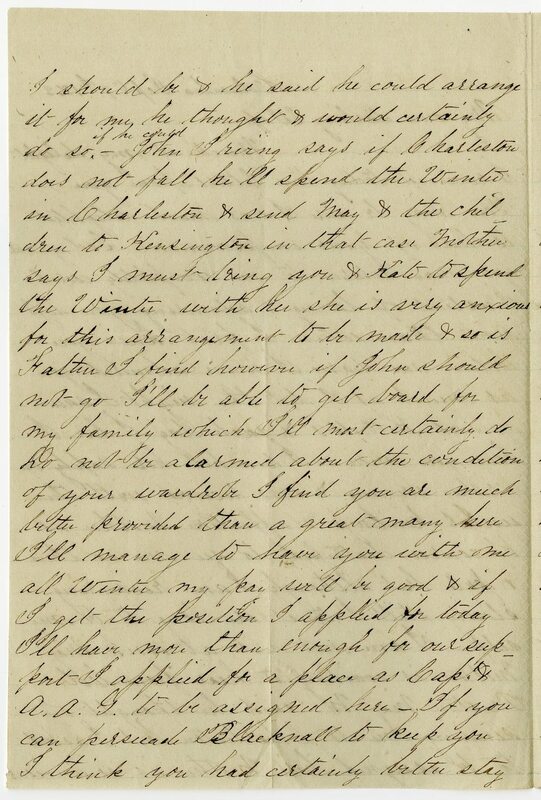 Item description: Letter, dated 9 September 1863, from D. H. Hamilton Jr. to his wife, Frances “Fannie” Roulhac Hamilton. He writes news about his own military assignments, the cost and procurement of household supplies, and military developments around Charleston, S.C., including the capture of Battery Wagner by Union forces. Much to my delight I received today two letters from you. You may be sure I was much delighted to hear of your improvement God grant you may return to me completely cured. Instead of loving & admiring you less now than when I first knew you believe me dearie I never admired you as much as I did the night I saw you at Kittrell’s & each day I live I love you more. I reached here safely on Friday evening & was received with the usual kindness & affection. Mother is of course distressed to see me so thin & pale but although I am recovering slowly still I trust ere long to be my-self. I am not yet at work. Maj. Melton is waiting to hear from Col. Preston. Maj. M. said he thought of sending me to Charleston but I asked to be assigned here. Mother is so anxious I should be & he said he could arrange it for me he thought & would certainly do so if he could. John Irving says if Charleston does not fall he’ll spend the Winter in Charleston & send May & the chil-dren to Kensington in that case Mother says I must bring you & Kate to spend the Winter with her she is very anxious for this arrangement to be made & so is Father. I find however if John should not go I’ll be able to get board for my family which I’ll most certainly do. Do not be alarmed about the condition of your wardrobe I find you are much better provided than a great many here. I’ll manage to have you with me all Winter my pay will be good & if I get the position I applied for today I’ll have more then enough for our sup-port. I applied for a place as Cap. & A. A. G. to be assigned here. 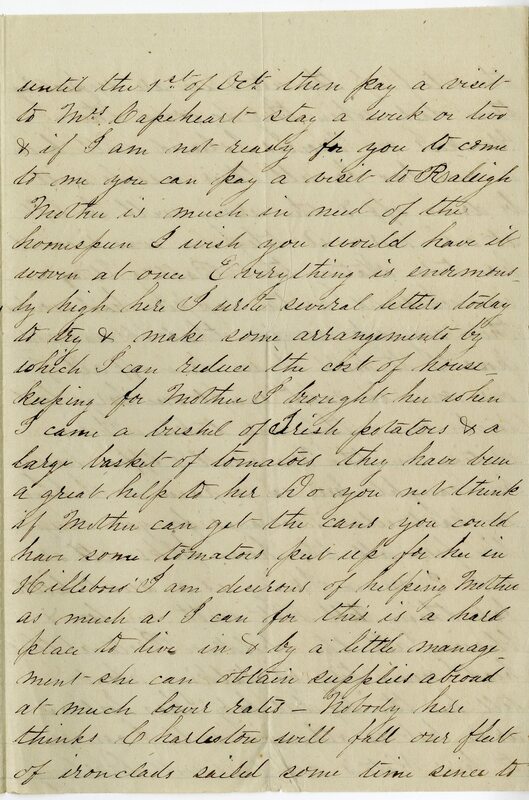 If you can persuade Blacknall to keep you I think you had certainly better stay until the 1st of Oct. then pay a visit to Mrs. Capeheart stay a week or two & if I am not ready for you to come to me you can pay a visit to Raleigh. Mother is much in need of the homespun. I wish you would have it woven at once. Everything is enormous-ly high here I wrote several letter today to try & make some arrangements by which I can reduce the cost of house keeping for Mother I brought her when I came a bushel of Irish potatoes & a large basket of tomatoes they have been a great help to her. Do you not think if Mother can get the cans you could have some tomatoes put up for her in Hillsboro. 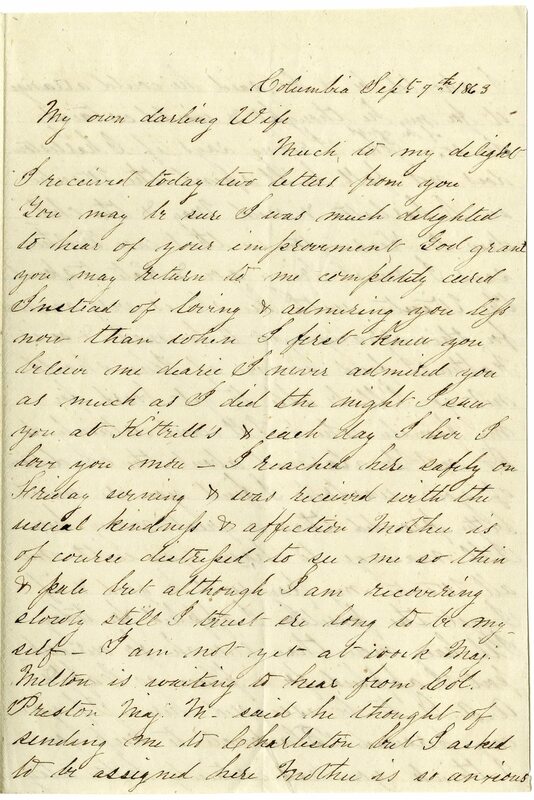 I am desirous of helping Mother as much has I can for this is a hard place to live in & by a little manage-ment she can obtain supplies abroad at much lower rates. Nobody here thinks Charleston will fall our fleet of ironclads sailed some time since to the relief of the city & we are expecting them daily when they do some the Yankees on Morris Island will be in a nice box for all their vessels will be driven off & the army will be left at our mercy. 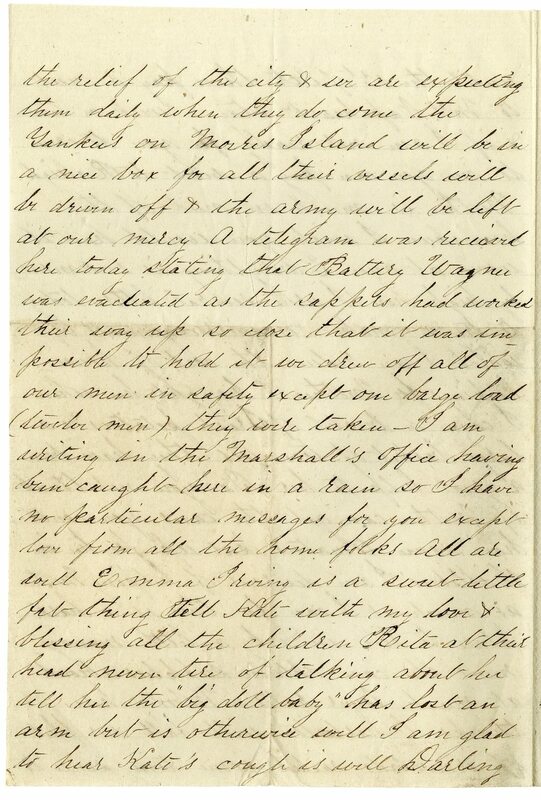 A telegram was received here today stating that Battery Wagner was evacuated as the sappers had worked their way up so close that it was im-possible to hold it we drew off all of our men in safety except one barge load (twelve men) they were taken. I am writing in the Marshall’s Office having been caught here in a rain so I have no particular messages for you except love from all the home folks. All are well Emma Irving is a sweet little fat thing. Tell Kate with my love & blessing all the children Rita at their head never tire of talking about her tell her the “big doll baby” has lost an arm but is otherwise well I am glad to hear Kate’s cough is well Darling. This entry was posted in Southern Historical Collection and tagged Battery Wagner, Charleston (S.C.), clothing, Columbia (S.C.), D. H. Hamilton Jr., food shortage, Frances Roulhac Hamilton, Hillsborough (N.C.), ironclads, Morris Island, Roulhac family. Bookmark the permalink.